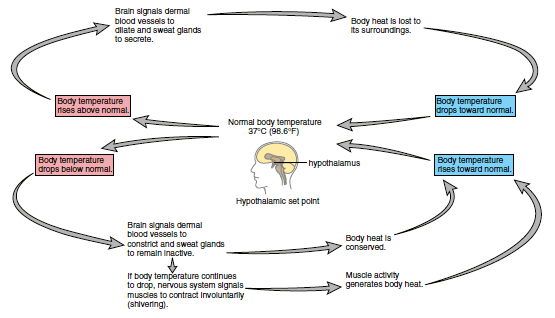 The thermostat for body temperature is located in the hypothalamus. When the body temperature falls below normal, the posterior hypothalamic sympathetic centre directs via nerve impulses the blood vessels of the skin to constrict. This conserves heat. Sympathetic stimulation also causes piloerection i.e. hair to stand erect and trap a layer of air that act as an insulator. However, this does not play a great role in humans. If body temperature falls even lower, the regulatory centre sends nerve impulses to the skeletal muscles, and shivering occurs. Shivering generates heat, and gradually body temperature rises to 37°C. Metabolic systems are also activated to produce more heat. When the temperature rises to normal, the regulatory centre is inactivated. When the body temperature is higher than normal, the regulatory centre directs the blood vessels of the skin to dilate.This allows more blood to flow near the surface of the body, where heat can be lost to the environment. Full vasodilation can increase the rate of heat transfer to the skin to up to eightfold. In addition, the nervous system activates the sweat glands, and the evaporation of sweat helps lower body temperature. Shivering and chemical thermogenesis is strongly inhibited. Gradually, body temperature decreases to 37°C.